I’ve noticed a lot of people asking about how to schedule when a user can or can’t use Facebook. This is pretty easy to do in Cyberoam, you can either do it globally, or on a per user basis. I’ll show you how to do this on a global basis. If you want to do this on a per user basis then you just need to make individual policies for your users. The steps below can apply to any website, not just Facebook. Step 1 – Log into your Cyberoam and go to the web filter section and select categories. Add one called “ScheduledSafeSites”. This will be for anything you want to allow during a certain time, if you want to block them name the category “ScheduledBlockedSites”. Personally I think only one for safe sites is necessary but I can see blocking say, Hulu.com during the day and let the night guy watch it. I went ahead and added “disney.com” to mine as an example. You can add facebook.com, or whatever you want here. Just like you would add sites to any other category. Step 2 – Check policy you want this added to and change both settings to “allow”. This is just the HTTP or HTTPS allow/deny settings. 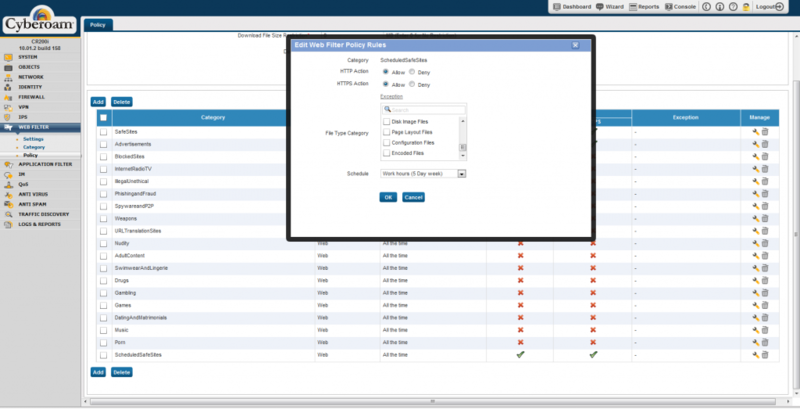 Step 3 – Go into the Policy setting under Web Filter and open up the policy you added the category to. Click the little wrench icon next to the new category. Step 4 – You can then select an right schedule. This particular example uses work hours, which is by default 10am to 7pm. You can go into the objects menu on the Cyberoam and edit or create any sort of schedule you want. Step 5 – Hit ok and save your changes, your users will now only be able to get to the site when you want. Notes: For this to work properly you need to make sure your Cyberoam’s time is correct. I’ve had a couple of instances where the time was off due to someone picking the wrong time zone during the first setup. If you are getting people who can get to the blocked site earlier than normal, go to the system menu and click on configuration. Most of the time it’s the time zone that is wrong, just find the right one. Sometimes during the initial setup the Cyberoam appliance will figure out what time zone it’s in based on the internet IP address, but if you have a weird ISP it might find the wrong one. It isn’t entirely human error that causes this and it’s really easy to miss.